The new app is available for free on the App Store starting today. TheStreet (TST on Tuesday launched its new mobile app for Apple's (AAPL - Get Report) iOS, providing business updates, stock analysis and investing commentary from the industry's top experts. For users who subscribe to TheStreet's premium content, the app will also provide a single point of access to current news, commentary and services. The app is currently available to download for free on Apple's App Store, with the option for in-app purchases. Click here to check it out. 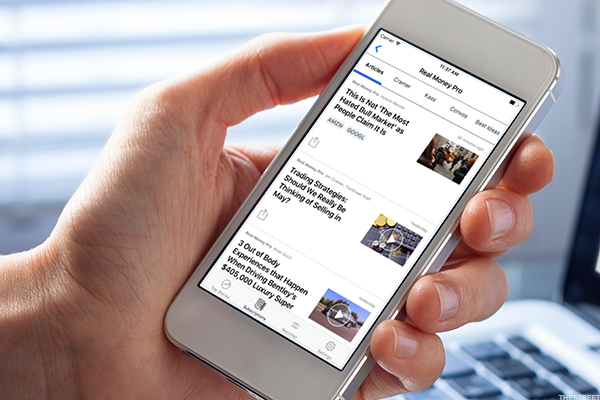 "We're excited to offer the best of both worlds in one app for the first time -- our great markets news and analysis combined with our valuable premium investment tools," said TheStreet's Chief Executive Officer David Callaway. "Users can default to their preferred view and all of our award-winning content works together. We look forward to working with Apple to bring this unique experience to both financial news junkies and our loyal subscribers." The information provided on the app is made for investors of all levels, and users can view watchlists, detailed quotes and charts on the app, as well as elect to receive push notifications for breaking news and trade alerts. In addition, subscribers to Jim Cramer's Action Alerts PLUS Portfolio will have access to strategy and trade tips.